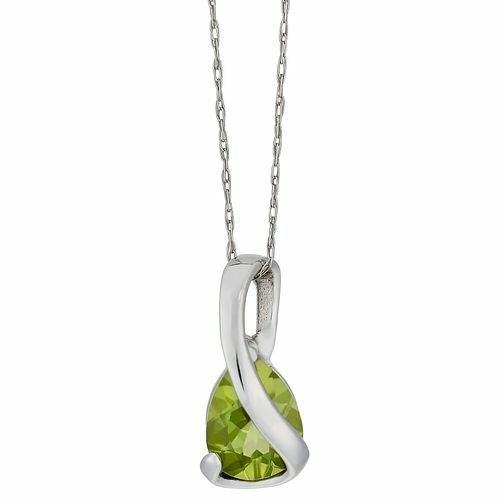 An elegant 9ct white gold wrap pendant surrounding a delicate pear shape peridot gemstone. Classic gold jewellery that makes a wonderful gift. 9ct white gold peridot wrap pendant is rated 4.7 out of 5 by 3. Rated 4 out of 5 by Anonymous from Nice stone in a stylish pendant The pendant and stone look great. The chain however is not as displayed in the picture. If you were looking for something slightly different from the chain you will be disappointed. It's a bog standard chain. Rated 5 out of 5 by Anonymous from Gorgeous pendant I'm sure this is set to become one of my favourite pieces. Excellent quality and so delicate to wear.